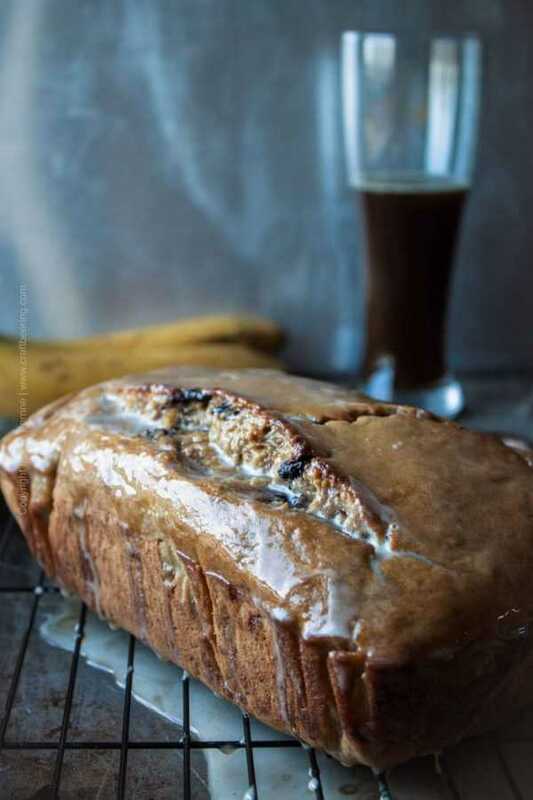 Beer Banana Bread with Dunkelweizen Beer Glaze. And Choc Chunks. 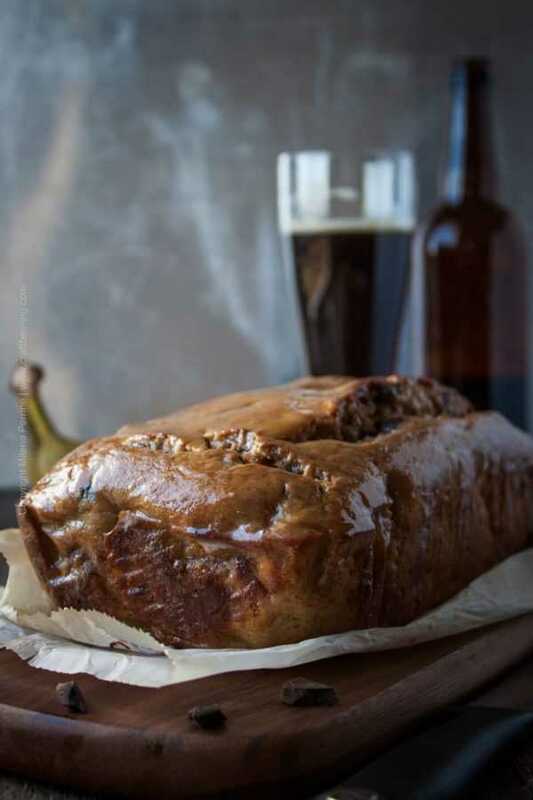 Beer banana bread is exactly what it sounds like – a banana bread loaf made with beer. In this case, it is not just any beer. It is a dunkelweizen. And it is not just an ingredient to the banana bread batter. A decadent beer glaze is in attendance as well. A dunkelweizen glaze that gets soaked up and results in an even moister loaf. Our recipe leverages the banana characters of the yeast used to ferment the wheat brew and the complex caramel/chocolate edge of its dark malts to perfection. We throw in semi-sweet chocolate chunks in addition to using the dark wheat ale. Another Perrine original cooking with beer recipe we are so excited to share. Especially considering the fact that the dunkelweizen was home brewed by Chris. (Dunkelweizen = ‘dark wheat’, from German, the style originated in Bavaria). I’m usually in charge of banana bread production at home. It is a bit of a staple on our breakfast menu mainly due to demand generated by our son (he also has ninety percent of the consumption covered). When I make it with beer I typically use German hefeweizen to capture the exquisite and very complementary banana, bubble gum and clove esters as well as the biscuity flavor of the style. It works beautifully. On those rare occasions that we have beer banana bread Chris is all over it. As am I, gotta compete for what is scarce. This dunkelweizen version however is by far superior to the plain hefeweizen one (I cannot believe I just used the word ‘plain’ next to hefeweizen, one of my favorite beer styles…oh, well). Anyways, Chris and I are in agreement that using dunkelweizen delivers a tastier, more complex beer banana bread. Perfect way to have beer for breakfast. Especially when semi-sweet chocolate chunks are added. 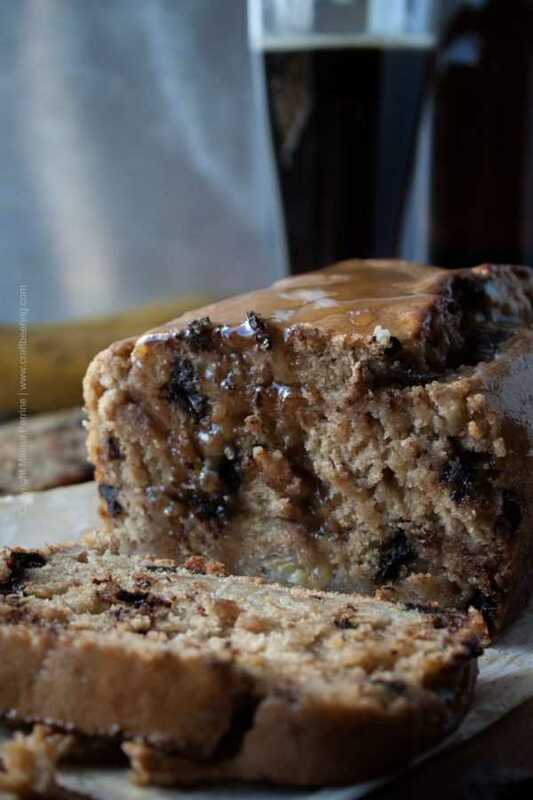 If you like chocolate, caramel and bananas, you will fall in love with this beer banana bread. If dunkelweizen happens to be a favorite of yours, you already know why. I need to step back and state this – you cannot fully relate to what I am describing if you have not previously indulged in a dunkelweizen. If this is your current situation I urge you to try a dark wheat beer as soon as you can. 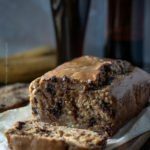 Why Use Dunkelweizen in Beer Banana Bread? It is such a delicious and creamy, yet light and drinkable style that you will be hard pressed to remain indifferent to it. As I mentioned above, Chris recently brewed it for us because we both love it so much (and he did an outstanding job). Even though not the most common of styles, there are plenty of breweries that make it and most liquor stores will carry at least one version of it, whether imported from Germany or brewed in the US. Sometimes it is referred to as Dunkel Weissbier or Hefe-Weissbier Dunkel, but it all means the same, a dark German style unfiltered wheat brew. The main characteristic of the style is the smooth and rich maltiness brought about by fifty to seventy percent dark wheat malt in the grain bill, aided by dark Munich or cara malt. Hops are in the back seat, there is virtually no bitterness. The characteristic citrus of hefeweizen made with American yeast is not present, it is replaced by dark fruit notes and hints of sweet toast, caramel and chocolate. The banana esters from the yeast are present in full force. Imagine a bowl of caramel covered bananas with chocolate sprinkles. But in beer form. Or moist banana bread with chocolate chips:) No wonder that there are so many home brewing recipes for dunkelweizen out there bearing names like ‘chocolate banana bread’ and ‘dark banana bread’. I believe that I need not convince you to choose ripe bananas and semi-sweet chocolate. And to use dark brown sugar. Self-explanatory given the profile of the beer you will be adding, right? Now, if you like very moist banana bread, you may consider my suggestion to under bake the bread. I am serious…I love to take out my loaf about 5 minutes before it would be considered perfectly baked. And in this instance, I could not drizzle it with beer glaze soon enough. It is simply confectioners sugar with a splash of dunkelweizen, allowing for all the beautiful aromas described above to come through. Much like the beer icing I whipped up for these IPA Mango Fritters but slightly runnier. I like it on the runnier side. I simply eyeball the ingredients, no particular proportions to refer to, I just use a more generous splash of the beer. When the beer glaze/icing is thinner, the beer banana bread absorbs it fully and becomes that much moister. You are then able to taste more of the fresh dunkelweizen flavors. This is how easy it is to make this beauty. I hope you bake yours soon. We’ll be here to accept your gratitude for cluing you in:) Cheers, friends! Beer banana bread is a banana bread with sweet, malty wheat beer with banana aromas. In this case, dunkelweizen ('dark wheat') adds a layer of caramel and chocolate goodness. A luxurious dunkelweizen glaze gets absorbed by the loaf turning it into a decadent moist treat you will enjoy. Line a standard bread loaf pan with parchment paper, grease the bottom and sides with oil. Set aside. Peel the bananas, place them on a plate and press with a fork until mashed. Set aside. In a mixing bowl mix the flour with the baking powder, salt and cinnamon. In a separate bowl beat the eggs, add the brown sugar and the melted butter and 1 cup of the dunkelweizen and whisk them together. Add the dunkelweizen mixture to the flour mixture and stir to combine well. Fold in the mashed bananas and the chocolate chunks/chips. Transfer the batter to the greased pan and bake for 50 minutes. Do monitor after the 40th minute, ovens differ. Once the bread is out of the oven, let if cool off a little and holding by the edges of the parchment paper remove it from the pan and place it on a cooling rack on top of a baking sheet. Immediately prepare the glaze. In a measuring cup with a spout or a small mixing bowl with a spout, whisk together the confectioners sugar with 1 tbsp of the dunkelweizen. Keep adding dunkelweizen by the half tbsp and whisking until you are satisfied with the consistency of the glaze. While the beer banana bread is still warm, gently remove the parchment paper from underneath it. Drizzle it with the glaze and let it absorb it. You can then transfer it with the cooling rack onto another baking sheet and drizzle it again with the glaze drippings from the first drizzle. Let it absorb the glaze and cool off and carefully slice. Enjoy! 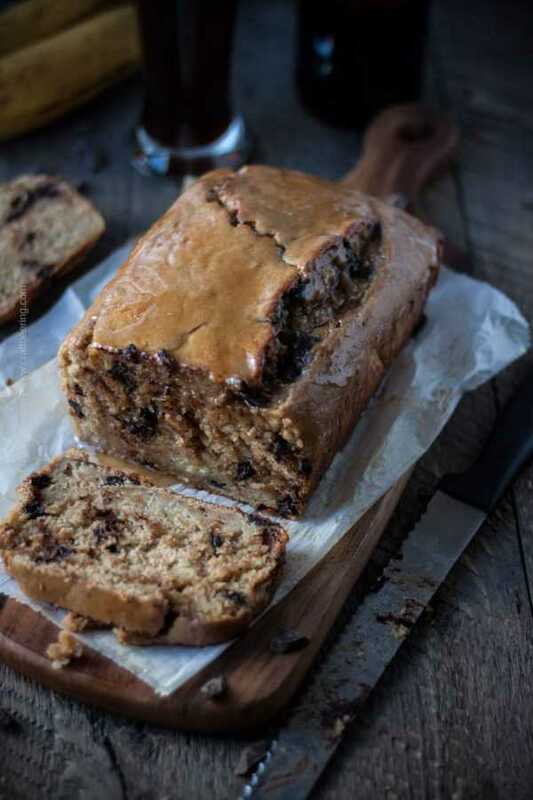 Mmmm…I love banana bread and this looks like a fantastic adaptation! Thanks so much for sharing at the #happynowlinkup! Your Banana Bread looks amazing! Thanks so much for sharing your post with us at Full Plate Thursday this week. Hope you have a great day and come back soon! Hey! How ’bout I put the coffee on? This is giving me all the feels! You two are a force! 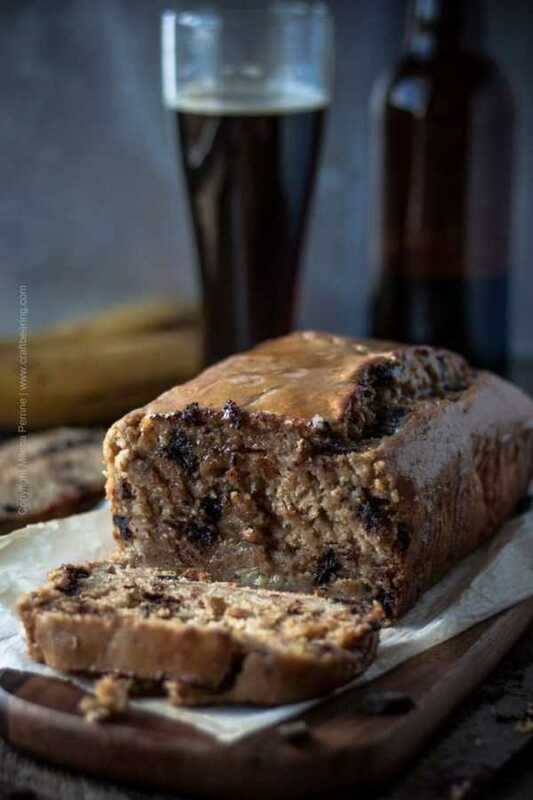 He brewed a great beer and you made this awesome beer banana bread with a yummy glaze! Love it! A slice, pleaseeee!! 😉 Loved your video as well!! Haha, luckily Chris and I like a lot of the same things. Thank you, Nicoletta! Yesterday I was thinking that it’s been too long since I made banana bread and here you are with a perfect recipe for me to try! This sound just delicious. And that glaze! I need this to happen today! Have a great weekend! Thank you so much, Kelsie! We’d be stoked if you tried the recipe, first taste the beer to get fully aware of the aromas and flavors and then once you make the bread it is so exciting to notice the exact flavors of the dunkelweizen echoed by the bread. Or the other way around – there is not telling which helps which, lol! I think beer is a natural in banana bread! Loving your version with all those chocolate chunks as well! We think alike then:) Thank you so much, Jennifer.